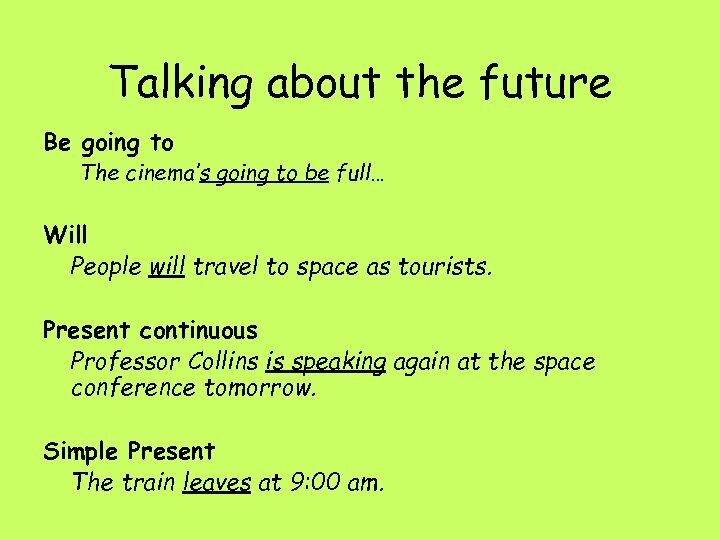 Talking about the future Be going to The cinema’s going to be full… Will People will travel to space as tourists. Present continuous Professor Collins is speaking again at the space conference tomorrow. 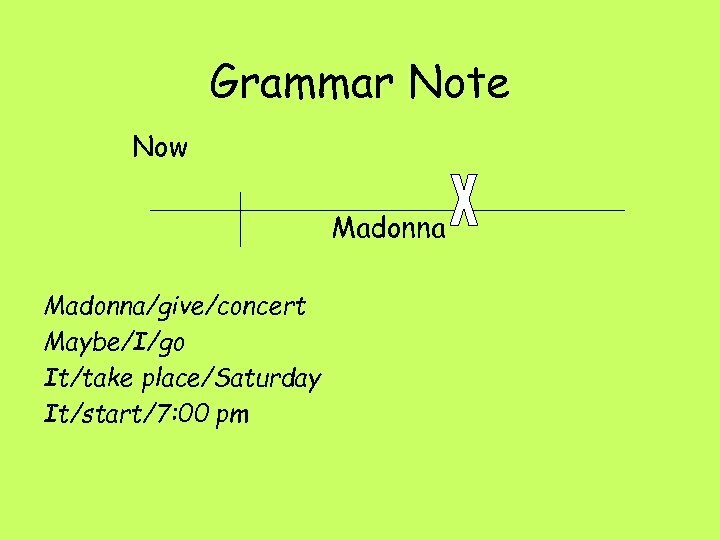 Simple Present The train leaves at 9: 00 am. 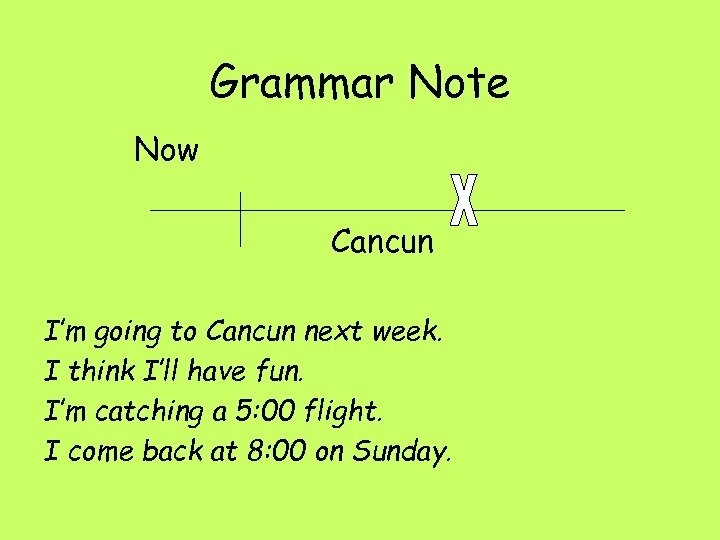 Grammar Note Now Cancun I’m going to Cancun next week. I think I’ll have fun. I’m catching a 5: 00 flight. I come back at 8: 00 on Sunday. 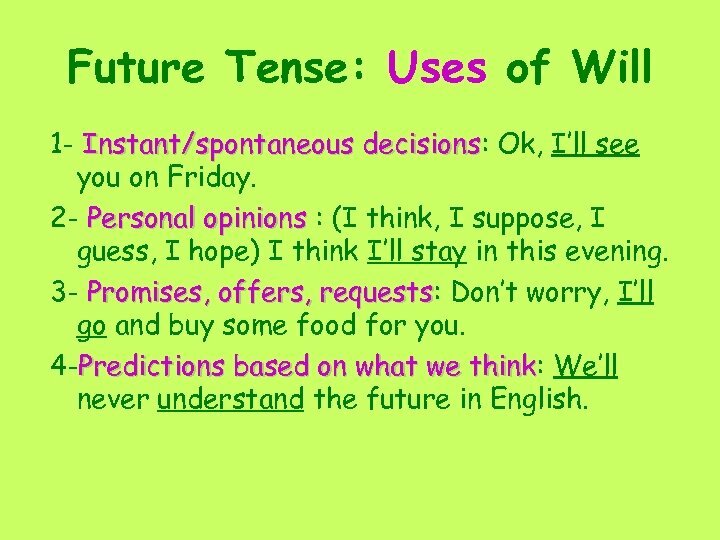 Future Tense: Uses of Will 1 - Instant/spontaneous decisions: Ok, I’ll see decisions you on Friday. 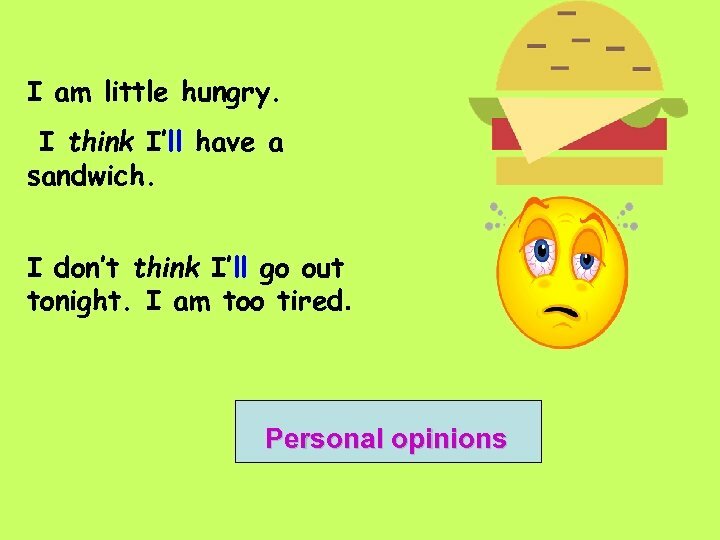 2 - Personal opinions : (I think, I suppose, I guess, I hope) I think I’ll stay in this evening. 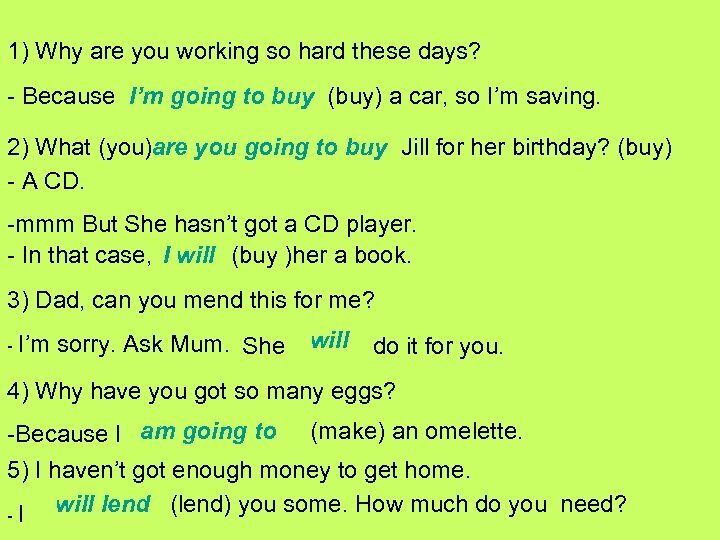 3 - Promises, offers, requests: Don’t worry, I’ll requests go and buy some food for you. 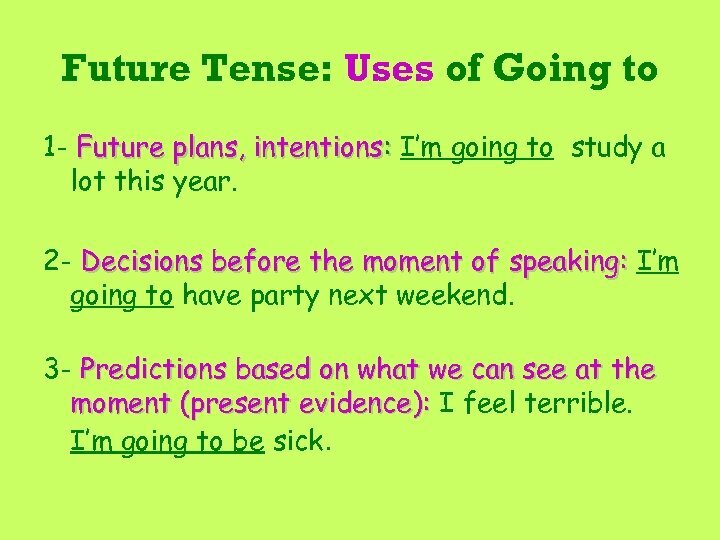 4 -Predictions based on what we think: We’ll think never understand the future in English. 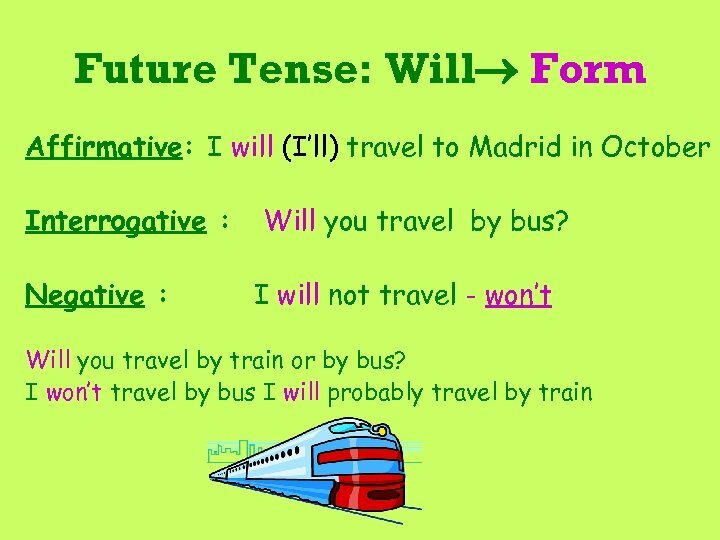 Future Tense: Going to Form Affirmative: I am going to travel by plane Interrogative : Are you going to travel by plane? 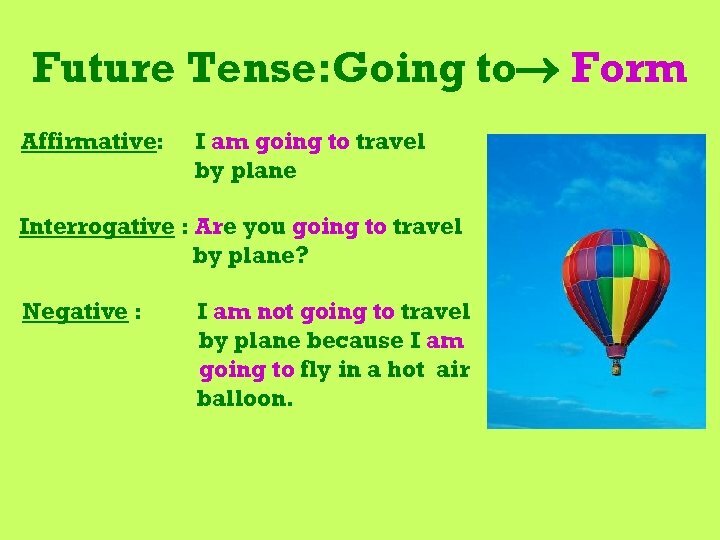 Negative : I am not going to travel by plane because I am going to fly in a hot air balloon. 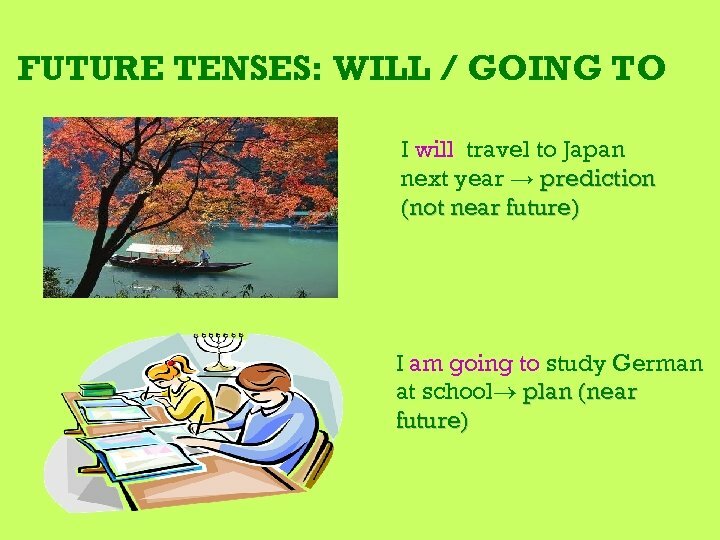 Future Tense: Uses of Going to 1 - Future plans, intentions: I’m going to study a lot this year. 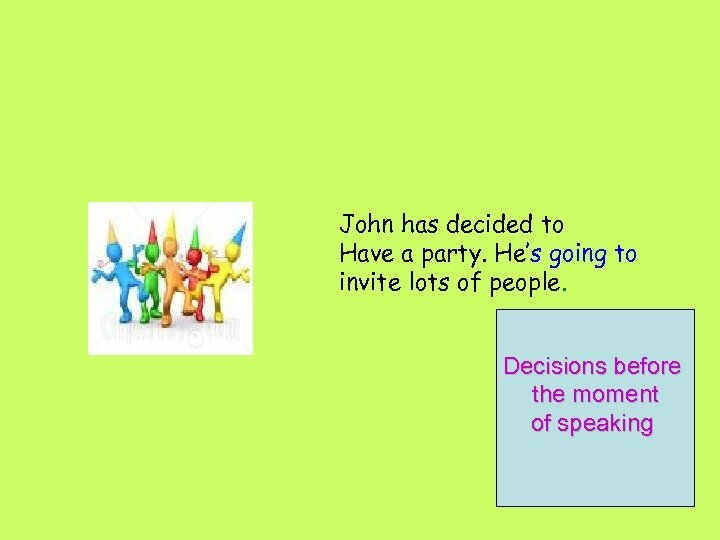 2 - Decisions before the moment of speaking: I’m going to have party next weekend. 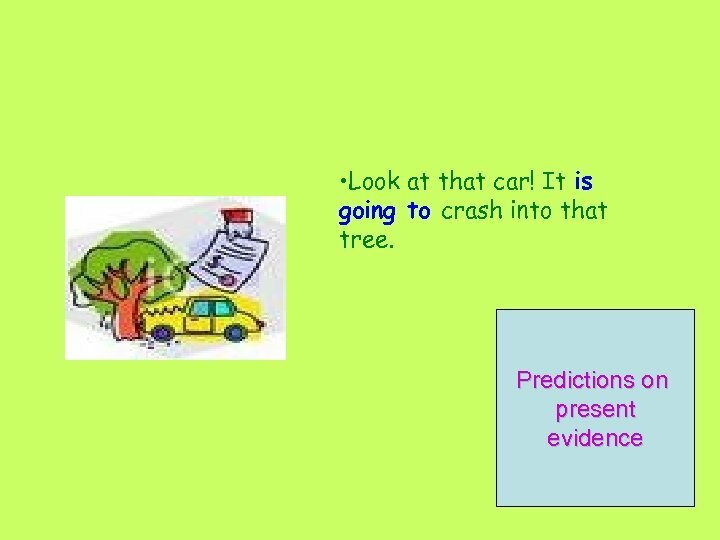 3 - Predictions based on what we can see at the moment (present evidence): I feel terrible. I’m going to be sick. 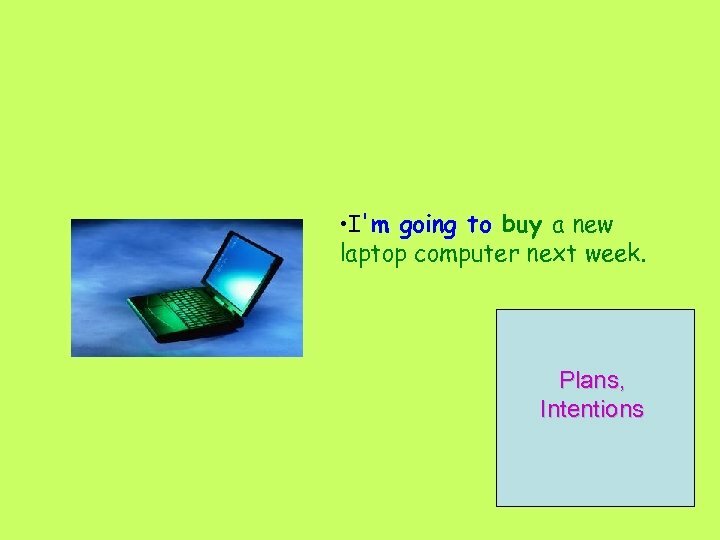 I AM GOING TO : I HAVE DECIDED TO DO STH. 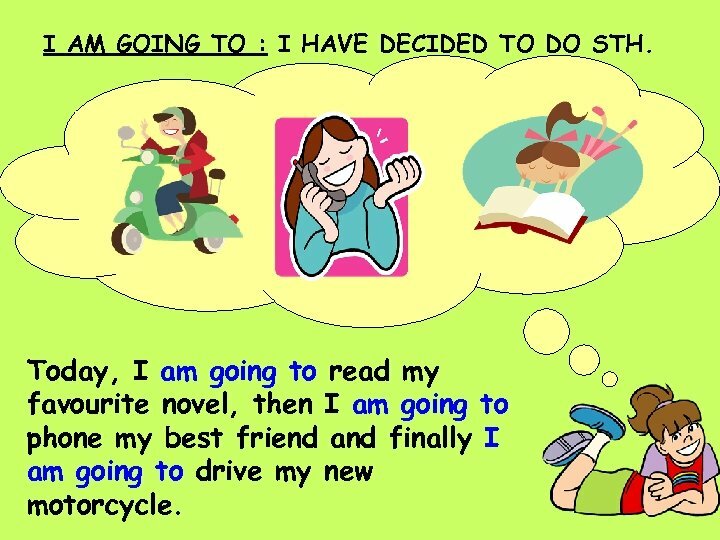 Today, I am going to read my favourite novel, then I am going to phone my best friend and finally I am going to drive my new motorcycle. 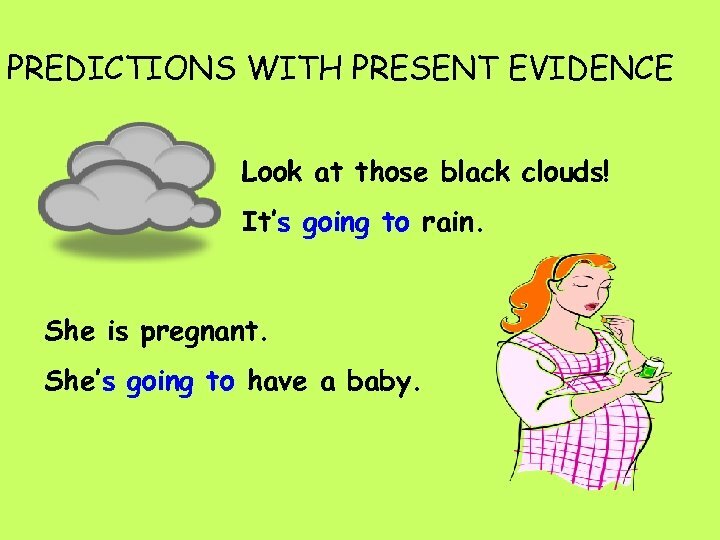 PREDICTIONS WITH PRESENT EVIDENCE Look at those black clouds! It’s going to rain. She is pregnant. She’s going to have a baby. 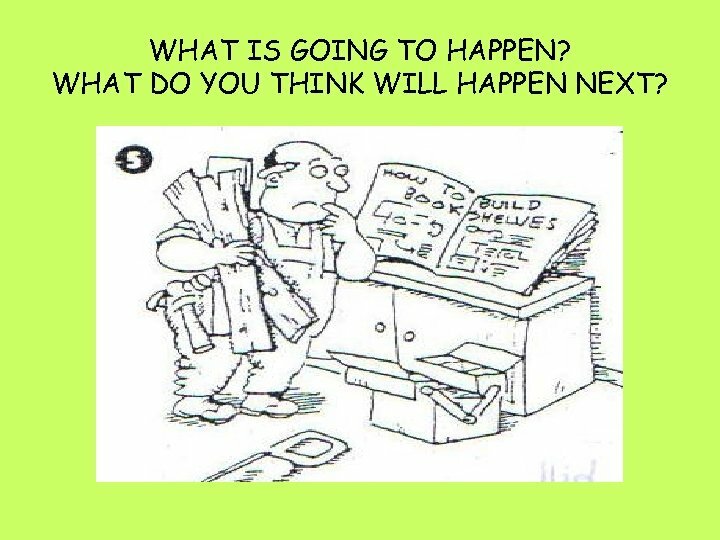 6) A: Why are you holding a piece of paper? 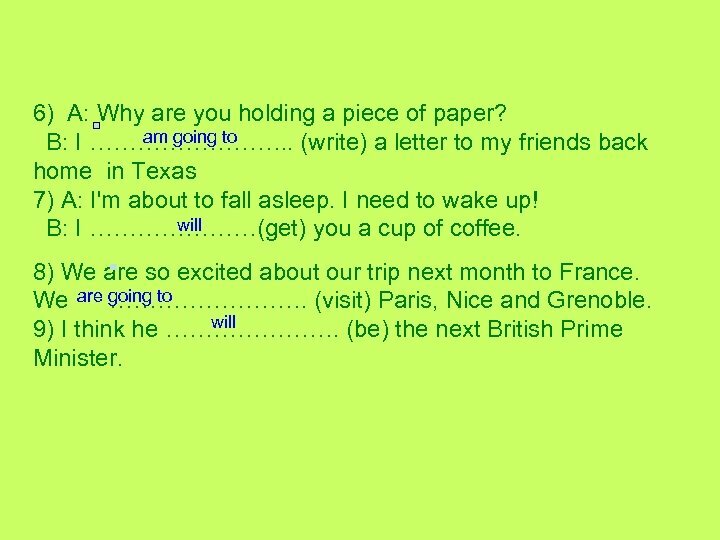 am going to B: I …………. . (write) a letter to my friends back home in Texas 7) A: I'm about to fall asleep. I need to wake up! 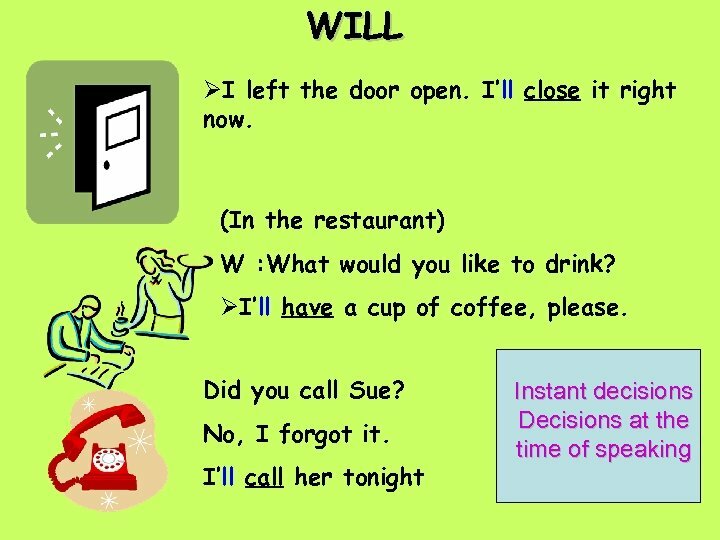 will B: I …………………(get) you a cup of coffee. 8) We are so excited about our trip next month to France. 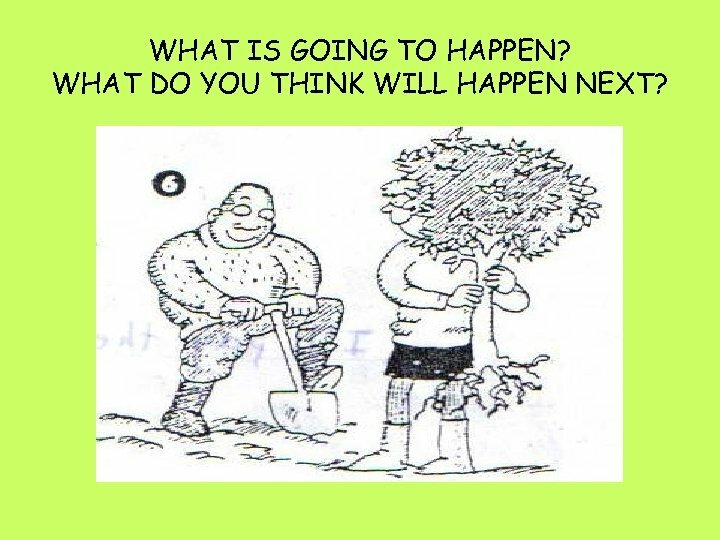 We are going to …………. (visit) Paris, Nice and Grenoble. 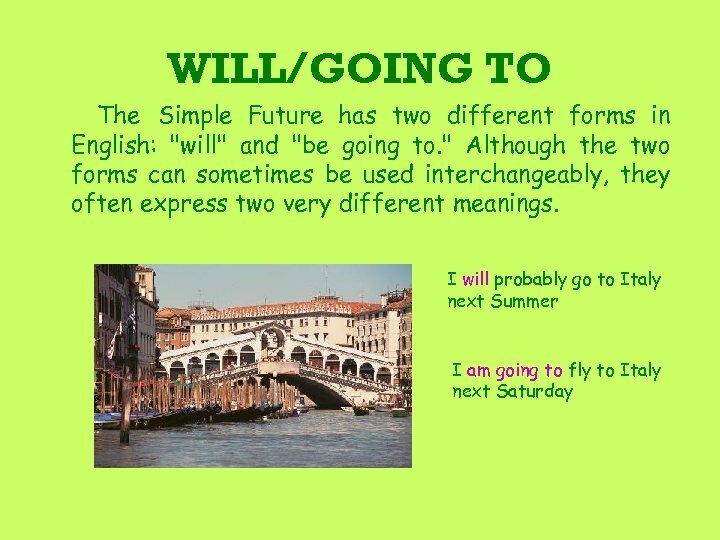 will 9) I think he …………………. (be) the next British Prime Minister. 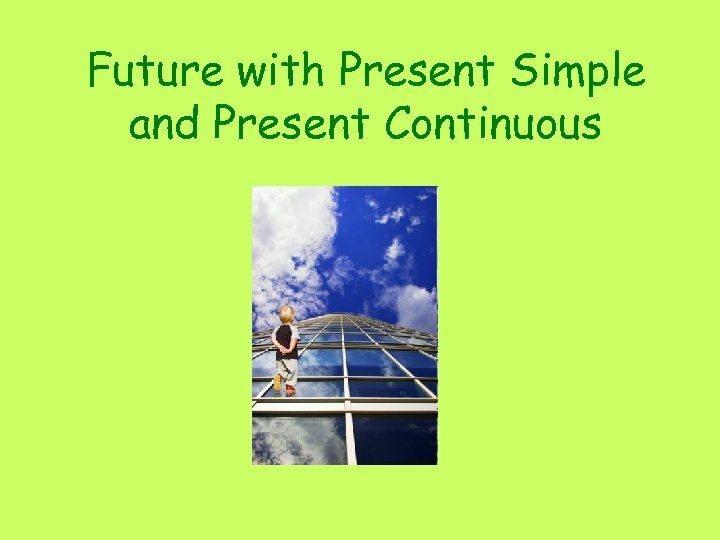 OTHER WAYS OF EXPRESSING THE FUTURE The simple present and present continuous are also used to express future time. 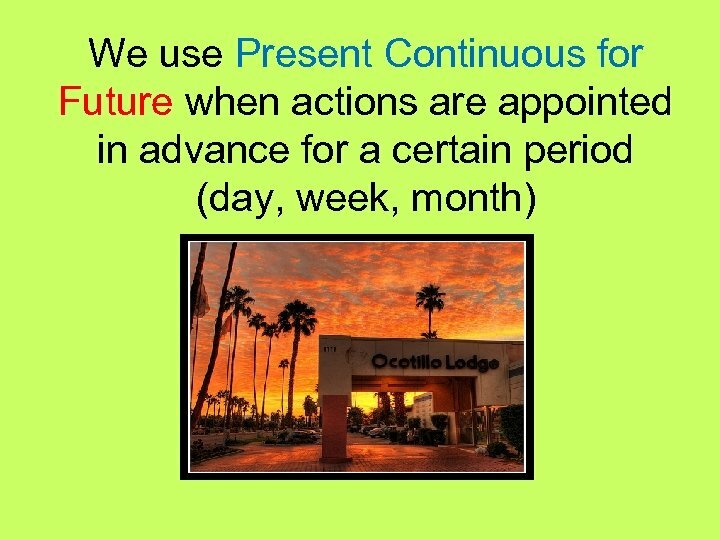 These are often used in connection with schedules. The train leaves at 6: 00 a. m. tomorrow. 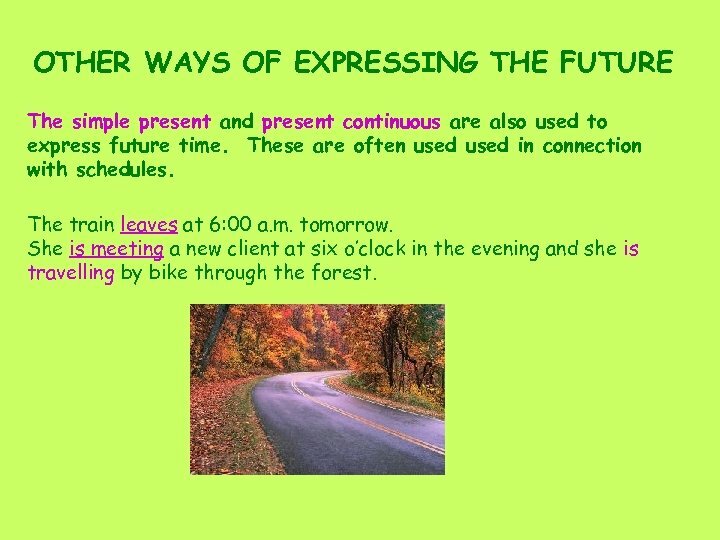 She is meeting a new client at six o’clock in the evening and she is travelling by bike through the forest. 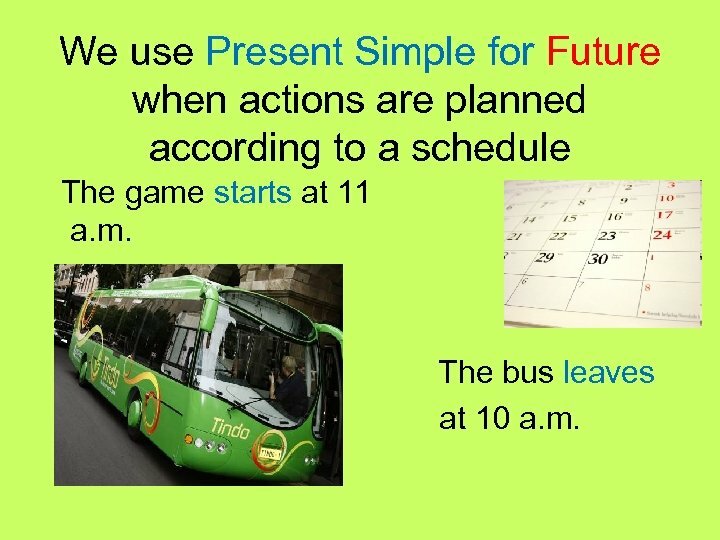 We use Present Simple for Future when actions are planned according to a schedule The game starts at 11 a. m. The bus leaves at 10 a. m.
I am meeting the manager at two o’clock. She is leaving for England on 28 th. 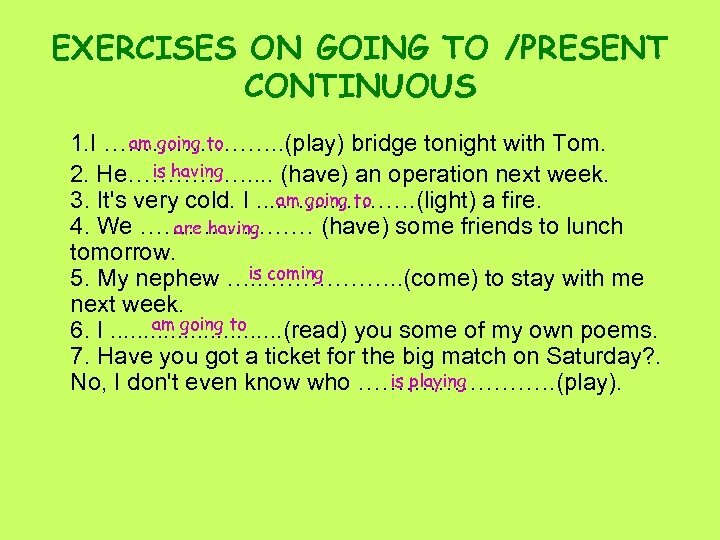 EXERCISES ON GOING TO /PRESENT CONTINUOUS am going to 1. I …………………. . (play) bridge tonight with Tom. 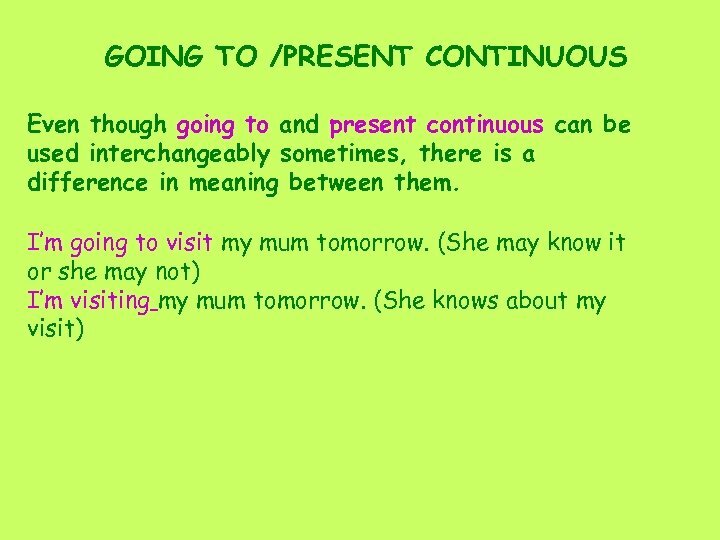 is having 2. 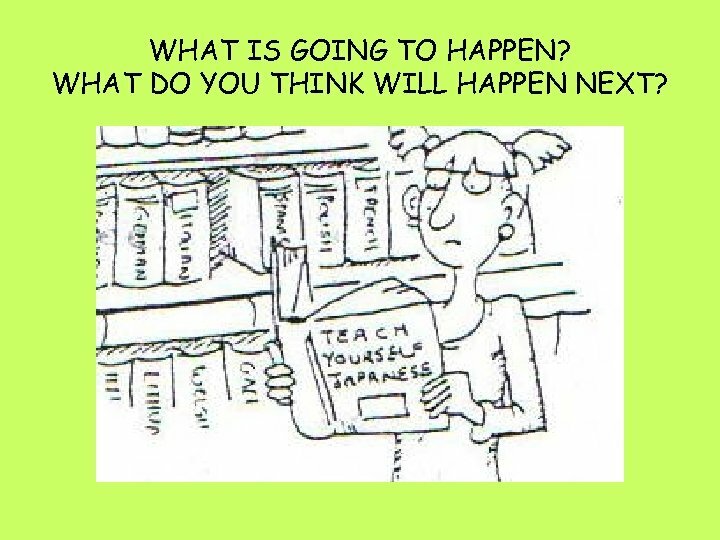 He……………. . (have) an operation next week. am going to 3. It's very cold. I. . . ……………. (light) a fire. are having 4. We ………… (have) some friends to lunch tomorrow. is coming 5. My nephew …. . . ……………. . (come) to stay with me next week. am going to 6. I. . . (read) you some of my own poems. 7. Have you got a ticket for the big match on Saturday? . is playing No, I don't even know who …………. (play). 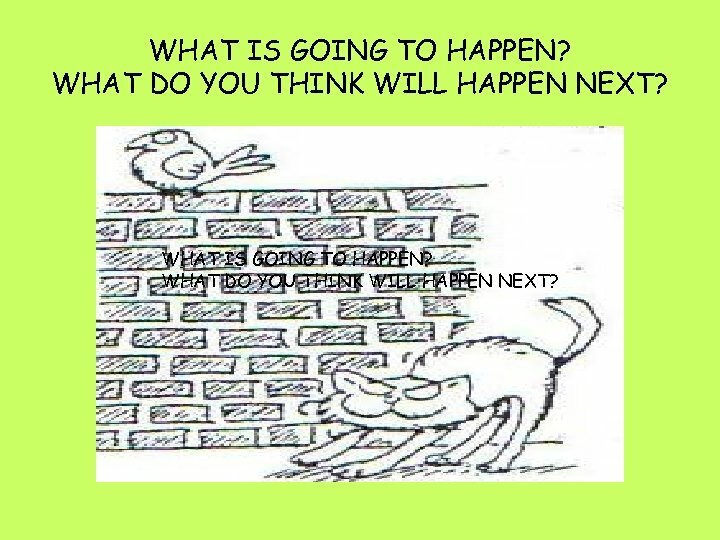 WHAT IS GOING TO HAPPEN? 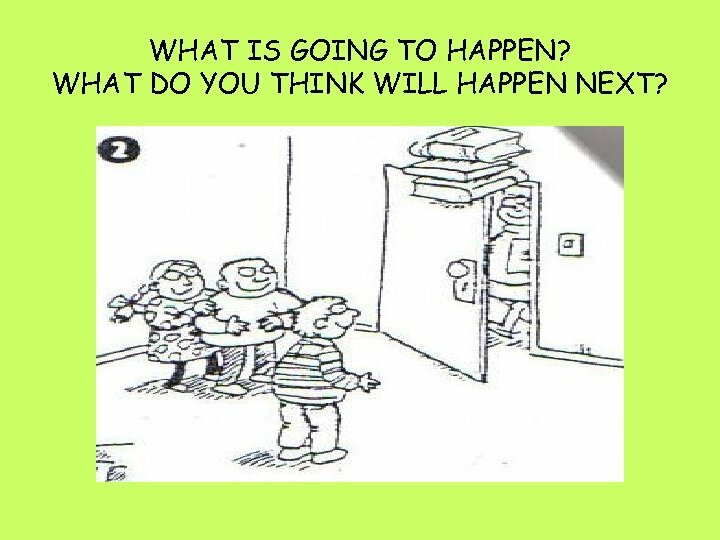 WHAT DO YOU THINK WILL HAPPEN NEXT? Dianarella is a princess. 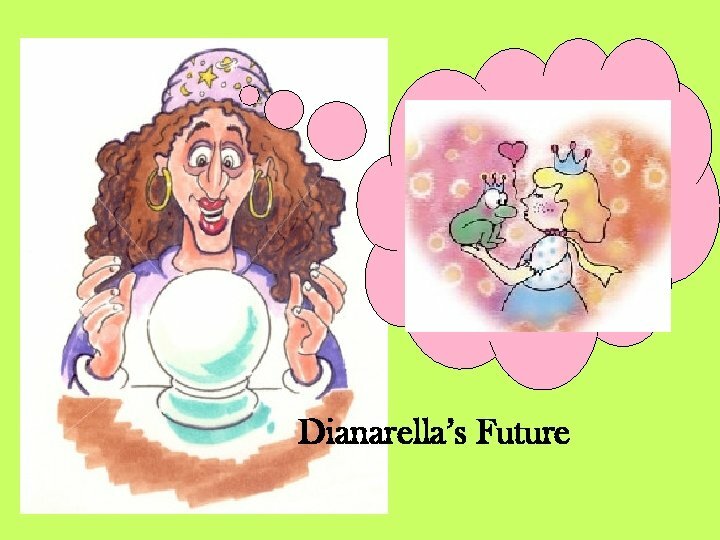 She wants to know what will happen to her in the future, so she goes to visit a fortune teller. 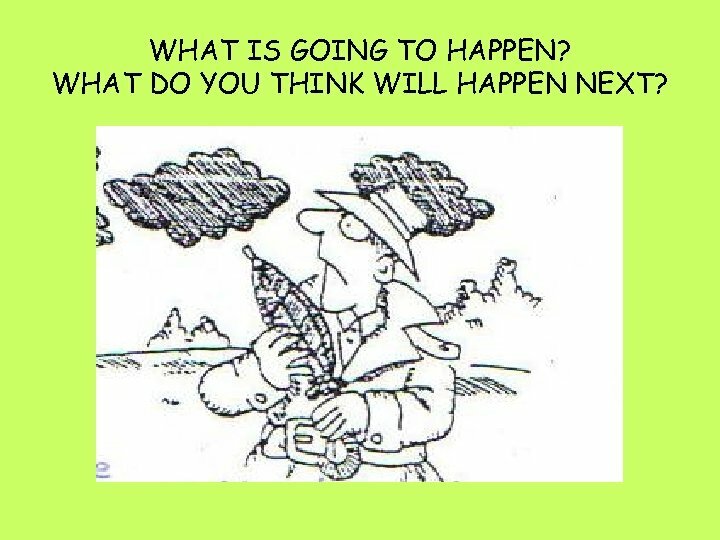 D: Can you see my future? FT: I certainly can. D: Tell me about it! 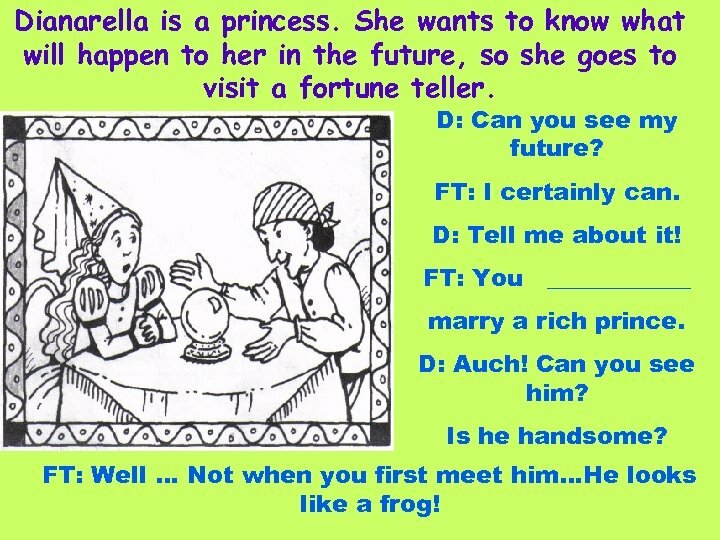 FT: You ______ marry a rich prince. D: Auch! Can you see him? Is he handsome? 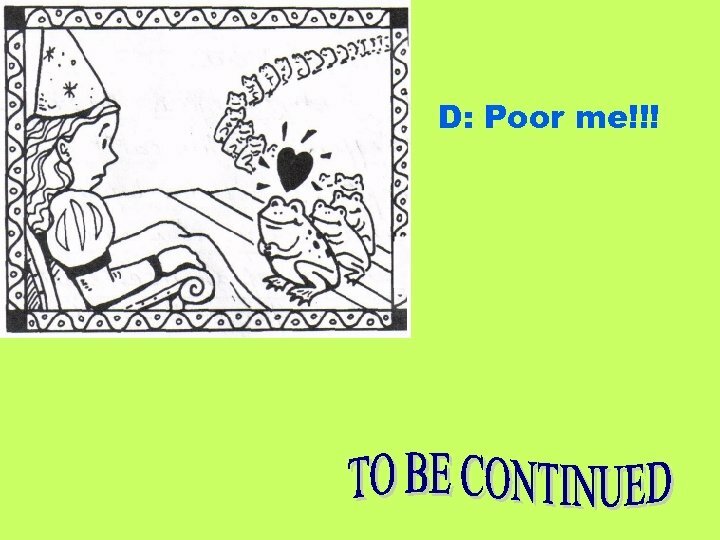 FT: Well … Not when you first meet him…He looks like a frog! (When Dianarella returns to her palace…) FT: Oh!! 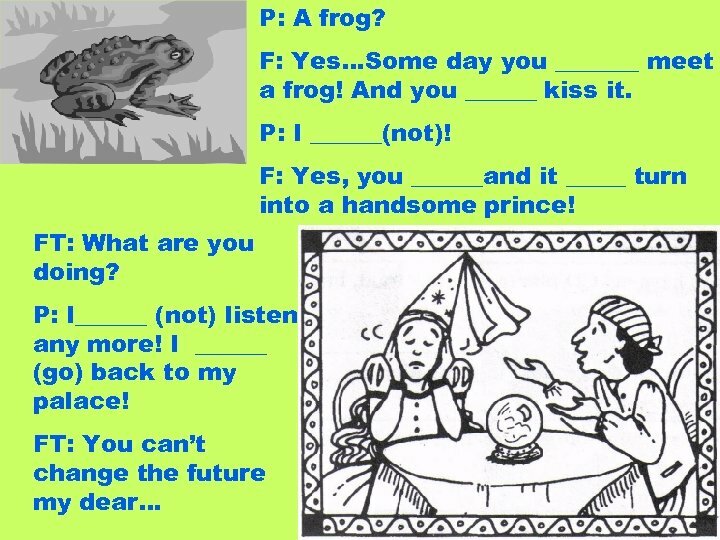 My dear, you _____ have to kiss a lot of frogs before finding the right one. Dianarella is a princess. 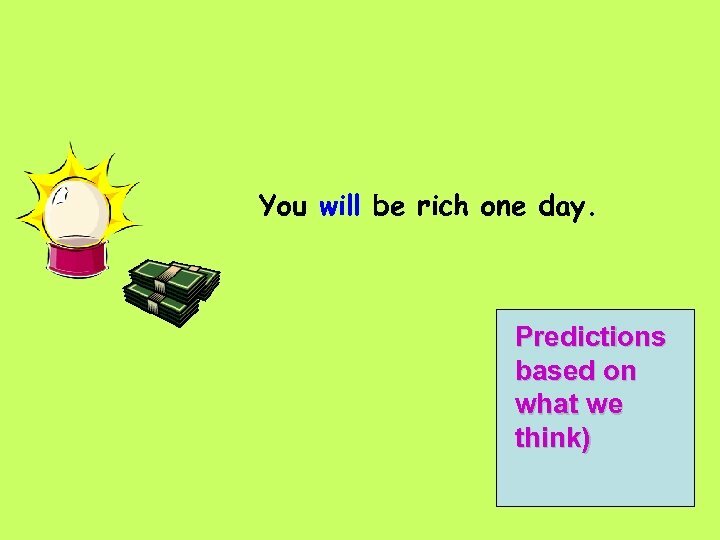 She wants to know what will happen to her in the future, so she goes to visit a fortune teller. 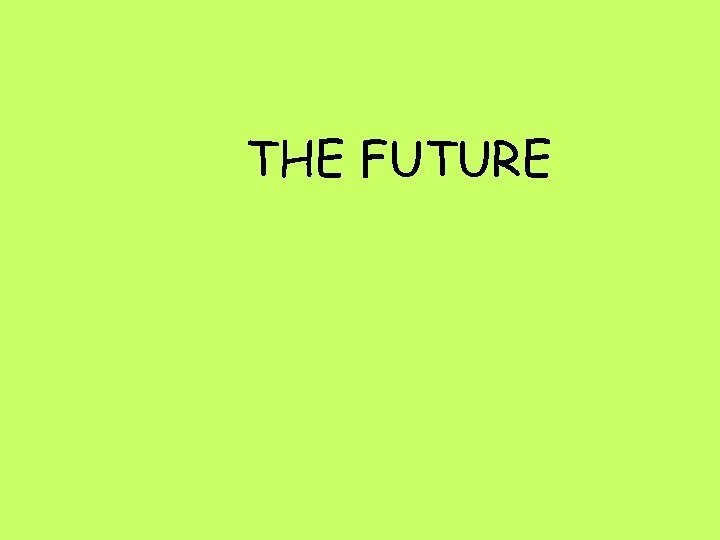 D: Can you see my future? FT: I certainly can. D: Tell me about it! FT: You will marry a rich prince. D: Auch! Can you see him? Is he handsome? FT: Well … Not when you first meet him…He looks like a frog! (When Dianarella returns to her palace…) FT: Oh!! 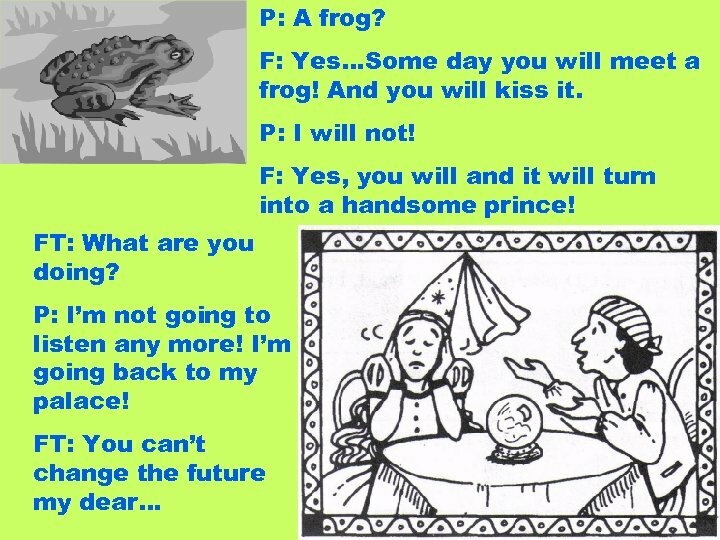 My dear, you will have to kiss a lot of frogs before finding the right one.